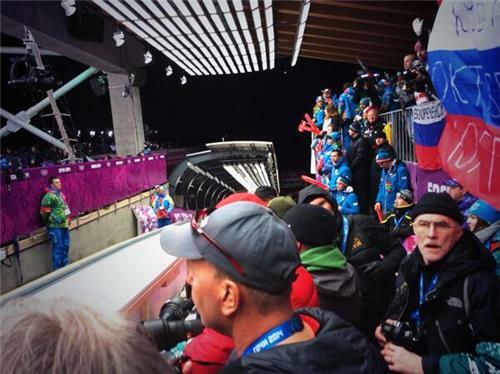 LUGE: Russia is up right now. The crowd is going wild! Italy on the course now. Germany next, than Canada! LUGE: Team Canada is up next!! LUGE: Germans currently in first. Canada is UP!! LUGE: First leg and Canada is about 0.5 seconds behind the Germans. LUGE: We've lost a bit of ground on the second leg. LUGE: Doubles team is up for the last leg! LUGE: We were pretty close, but unfortunately no luge medal for Canada at these Winter Games. Puck drop! The men's hockey game between Canada and Norway is on. 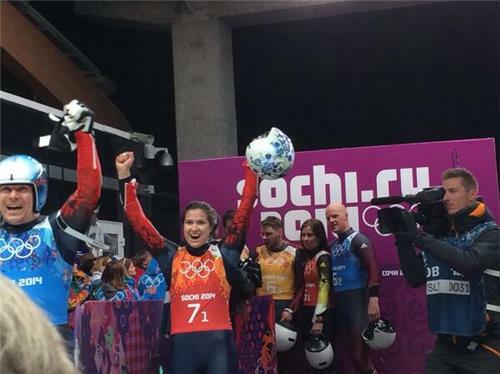 LUGE: And Germany wins gold, Russia takes silver, and Latvia takes bronze! 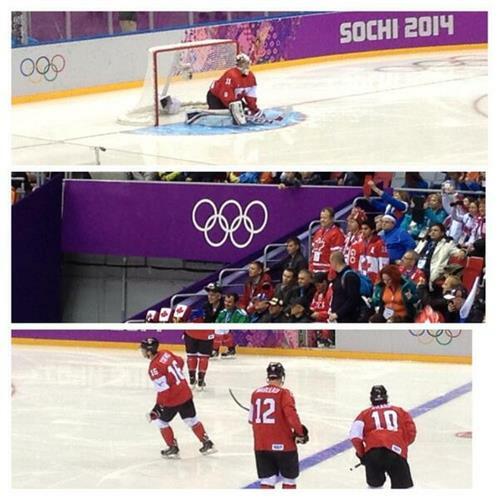 What's the energy like in Sochi, Callum? LUGE: Thanks for tuning in to our luge coverage folks! This is the final luge event of the Games, but keep it here for coverage of BOBSLEIGH and SKELETON. In the mean time, make sure to switch over to our hockey/ figure skating coverage going on this very second. HOCKEY: As far as Canadians go it is excitement, at the same time there are plenty of Norwegian fans...although Norway isn't a hockey powerhouse, they are in winter sport. Norway hits the back of the net! "I like being in second, I like being in the chase... Now I can go out and enjoy my program." - Patrick Chan. We'll have a story on Chan's reaction and where things stand on Olympic.ca later. The final flight of skaters are now finishing their warmups. Brezina, as I wrote earlier, will skate first. His opening element a quad salchow. Brezina completes his short program. He looks relieved. Seemed to come in a bit stiff and nervous but warmed up. Now he looks much happier. 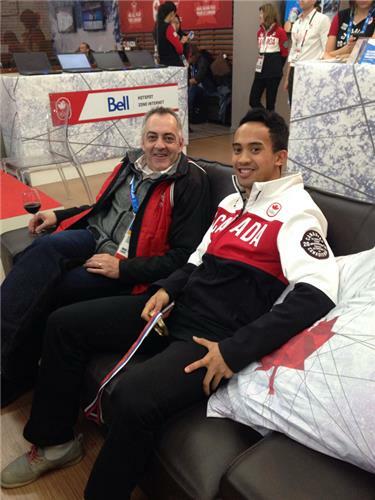 Gaétan Boucher and Gilmore Junio catching the hockey game at Canada Olympic House!